Home How Is Child Support Determined in Wyoming? What Are Child Support Guidelines and Tables? In Wyoming, child support is expressed in a specific dollar amount derived from the combined net income of both parents, the number of children, the nature of the custodial arrangement and percentage figures given in the presumptive child support tables this is revised every four (4) years by the Wyoming Department of Family Services. To calculate the non-custodial parent’s Wyoming child support obligation, the total child support obligation of both parents is first determined. The total child support obligation is calculated by applying the percentage given in the appropriate child support table against the net monthly income of both parents. Wages derived from overtime will not be included in the calculation of net monthly income, unless it is reasonable to expect overtime wages will continue to be earned on a consistent basis after taking into account the history of the overtime wages earned within the preceding twenty-four (24) month period. Child Support Calculations in Wyoming. Statutory child support tables are used to calculate the total child support obligation of both parents. The percentage of child support to be applied against the combined net income of both parents increases as the number of dependent children of between the parents increases. Each parent’s net income is used to calculate a percentage of the combined net income of both parents. Each parent’s percentage is multiplied against the total child support obligation of both parties. Net income is defined as each parent’s total gross income from all sources, except means tested income, less income taxes, social security deductions, cost of dependent health care coverage, mandatory pension deductions, and actual payments being made under preexisting support orders for current support. The calculation of net income is required to made using a Confidential Financial Affidavit (“Affidavit”) that is approved by the Wyoming Supreme Court and that must have attached to it relevant financial records, including wage stubs for the preceding twelve (12) months and income tax returns and W-2s for the last two years. The Affidavit requires that the preceding twelve (12) month period be used as the time frame for calculating net income. Determining the net monthly income of both parents may be as easy as locating last year’s W-2 statement and this year’s most recent paystub for each parent. But where a parent is not working or is underemployed, the parent’s potential earning capacity will be imputed to the parent based on his or her work experience, earning history, training, education and ability to earn. The imputed wage may be a high or low figure depending on the circumstances. Imputing a wage to a parent often does not lend itself to a straightforward calculation. Instead, the parties’ agreement on the amount of income to impute, or the court’s judgment as to the amount of income to impute will be founded on factual circumstances that are unique to each case. As an example of how to calculate child support, consider the following hypothetical that uses percentage figures taken from the Wyoming child support tables. If there are two children for whom child support must be calculated and if the combined net monthly income of both parents is $6,500.00 per month, then the TOTAL child support required for both children is 26.7% on the first $5,498.00 and 15.2% on the remaining $1,002.00. Thus, the total child support obligation for both parents is $1,620.27. If the non-custodial parent’s proportional share of the $6,500.00 per month is 60%, then the non-custodial parents’ monthly child support obligation is 60% of $1,620.27 or $972.16. Typically, the child support figure is rounded off to the nearest five-dollar increment, or in this example, to $970.00. 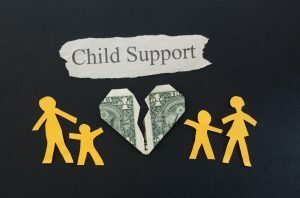 If custody is split with at least one child living with each parent, the parent earning the higher income will pay a reduced child support amount to the other parent in Wyoming. As an example, if there are three children and the higher earning parent’s child support obligation for all three children would be $1,200.00 if custody were not split and if one child is in the physical custody of the higher earning parent and two children are in the physical custody of the other parent, then the child support obligation payable by the higher earning parent to the other parent would be $800.00. If custody is not split, but each parent keeps the children overnight for more than forty percent (40%) of the year and both parents contribute substantially to the expenses of the children, then the proportionate share of the total obligation of each parent, as determined by the child support tables, shall be multiplied by the percentage of time the children spend with higher earning parent to determine the higher earning parent’s support obligation to the other parent. If you track the instances when a percentage calculation was performed with split and shared custody, three different percentages applied to reach the correct, legal result. “There is no trust more sacred than the one the world holds with children. There is no duty more important than ensuring that their rights are respected, that their welfare is protected, that their lives are free from fear and want and that they can grow up in peace.“ Kofi Annan.